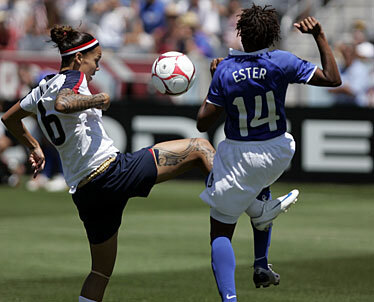 Former Kahuku and Hawaii standout Natasha Kai fought Brazil's Ester for the ball yesterday in Commerce City, Colo. The U.S. defeated Brazil 1-0. COMMERCE CITY, Colo. » The United States women's soccer team tuned up for the Olympics with another shutout. Amy Rodriguez scored in the 71st minute and the U.S. women posted their sixth straight shutout in a 1-0 win over Brazil in an exhibition match yesterday. The U.S. is 21-0 in 2008, including a penalty-kicks win over Canada. The U.S. and Brazil meet again Wednesday in San Diego in their last match before the Olympics start next month in Beijing. The U.S. faces Norway on Aug. 6 in its Olympic opener. "Any time we go out on the Olympic or national level it's important to us," said Rodriguez, who has five goals in 17 games this year. "Every win counts, and with every game we want to get better so not only is the win important but the overall play and chemistry of the team. We just want to be ready for the Olympics." The U.S. Women's National Indoor Volleyball Team, with Punahou graduate Lindsey Berg the starting setter, won a battle of momentum against sixth-ranked China as the Americans held on for a 25-23, 25-19, 22-25, 21-25, 17-15 win yesterday on the final day of the FIVB World Grand Prix Final Round at the Yokohama Arena in Yokohama, Japan. Two former Hawaii All-Americans - setter Robyn Ah Mow-Santos and middle Heather Bown - were used as substitutes for Team USA, 2-3 in the final round. The Americans were 7-2 in the preliminary round. "We are very excited to come out of our last game of this tournament with a win and playing with a lot of heart and fight because that is what we will need in the Olympics," said Berg, who had 15 assists and an ace. "Everybody on the team contributed and it is great when you can do that. We will take this into the Olympics and fight every match." » Former Hawaii All-American Clay Stanley had 11 kills as the U.S. Men's National Volleyball Team advanced to the FIVB World League final round with a 24-26, 25-22, 25-13, 25-18 victory over Spain on Saturday before a crowd of 4,957 at the U.S. Cellular Coliseum in Bloomington, Ind. Stanley added three aces and two blocks for the U.S., 9-1 in Pool C. The victory clinched a spot in the World League final round on July 23-27 in Rio de Janeiro, Brazil. Joy Monahan of Hawaii won her Round 4 heat yesterday to advance to the quarterfinals of the ASP Women's Longboarding Championship Roxy Jam off Biarritz, France. Monahan had the second-highest score of the day (13.75) and will face American Rachel Barry tomorrow. Former Hawaii standout guard Alika Smith headlines the staff of the Pete Smith Basketball Camp, which begins later this month. The camp, named for Alika's late father and longtime Kalaheo basketball coach, has two sessions for boys and girls, ages 5 to 18. The July 21-25 session is from 8 a.m. until 3 p.m. at Kalaheo High gym. The second session, July 20 to Aug. 1, is from 9 a.m. until 4 p.m. at the Hongwanji Mission gym at 1727 Pali Highway.